People interested in becoming more engaged in philanthropy and humanitarian aid often ask themselves “how can I make a difference, as just one person?” Likewise, in the architectural community, many designers pose a similar question regarding design competitions: “I am just one designer - what are my chances of winning this competition?” But what if an organization were to marry the two questions by combining design competitions with humanitarian aid? Would the same questions result, or would a new question be born—can my designs change the world? Building Trust International knows that design can change the world, and change it for the better. Through their architectural and design competitions, they instigate a process that delivers catalysts for positive change, from improved schools for migrant and refugee communities, to flood-resistant homes for Cambodia’s poor and low-cost housing solutions for homeless individuals in the UK. Building Trust champions a participatory process, embedded in the needs and the aspirations of the local communities it serves. In a western culture where design has become synonymous with style and authorship, Building Trust recognizes that the true value of design lies in harnessing it to help those in need globally, through creative and collaborative solutions.Building Trust In Design UK-based non-profit Building Trust International explains how a competition based design organization can change the world. +Written by Francesca Perry Photography provided by Building Trust International It was with the idea that design is a powerful tool for social change, along with an insightful visit to the Burmese border that led to the creation of Building Trust,” co-founders David and Louise Cole explain. Whilst at the Thai-Burmese border, they witnessed the struggling children of displaced, stateless Burmese refugees, who were being uprooted due to the lack of land rights. David and Louise soon had the idea of creating a mobile school building that could be disassembled and transported as the refugees moved, thus providing a sustainable education solution for the community. In 2011, they launched their first design competition as Building Trust International to find the best proposal for the school project. 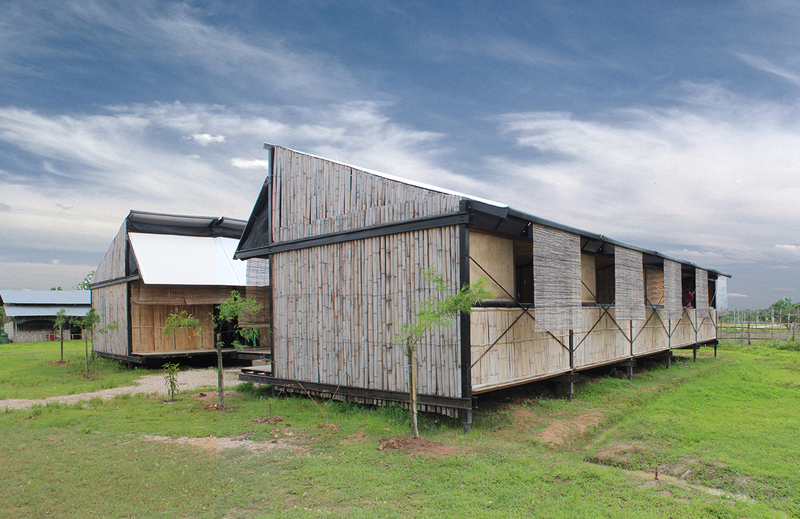 The Coles returned to the border after selecting the winning design with local NGO’s and school members, and with the help of local apprentices, built the first “MOVINGschool.” To date, three MOVINGschools have been built, all capable of being dismantled and reused to accommodate the needs of these refugee and migrant communities. 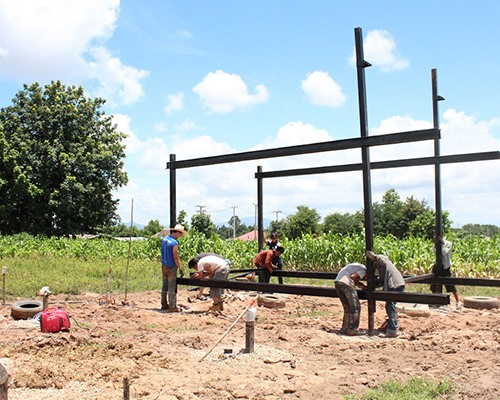 The construction of the MOVINGschools project was based on a light gauge metal frame that could be assembled like a kit of parts by any community. Such positive projects, of course, rely heavily on funding. All current Building Trust projects have been funded through charitable activities such as design competitions and fundraising, as well as through partnerships with corporate sponsors, fellow NGOs and international grants. “The main challenge we face as an organization,” the Coles explain, “is sourcing funding for projects and staff. We are always on the lookout for new partners to join our team and help us deliver more humanitarian design solutions around the world.” It seems that, as in many cases, the more positive the social impact of a project, the more difficult it can be to secure funding; this is a problem that continues to hold back the design world from achieving widespread benefits for those in need. There are, however, more promising developments in design practice to celebrate. The Building Trust co-founders agree that themes such as community involvement and the use of less environmentally damaging materials are, encouragingly, on the rise. But terms such as “sustainability” have now become so all-encompassing that they cease to possess real meaning. Designers are in danger of using sustainability as more of a trend rather than a driving principle. Whilst the co-founders of Building Trust are heartened to see more interest from younger designers, architects and engineers in similar charitable organizations—and they hope that this interest can begin to materialize more in mainstream commercial architecture—they are aware that change also needs to be driven by clients. According to the Coles, “This is where design could change slightly, in designers being perceived as catalysts for design rather than providers of design. It may seem like a subtlety, but in practice it means more fruitful relationships between client, community and designer that transform into better buildings and urban environments for us all.” It is surely within the relationship between stakeholders and deliverers that most of the challenges – as well as the opportunities – of design lie. There is a pressing need to align interests and share notions of value, because this promotes collaboration over traditional hierarchies. Finished photo from the MOVINGSchool project. Indeed participatory processes are at the heart of the Building Trust ethos: one of the charity’s main aims is to ensure all projects are worked through with the local community. “It is key to making the project a success by engaging the local people and ensuring the building is truly theirs,” the Coles explain. 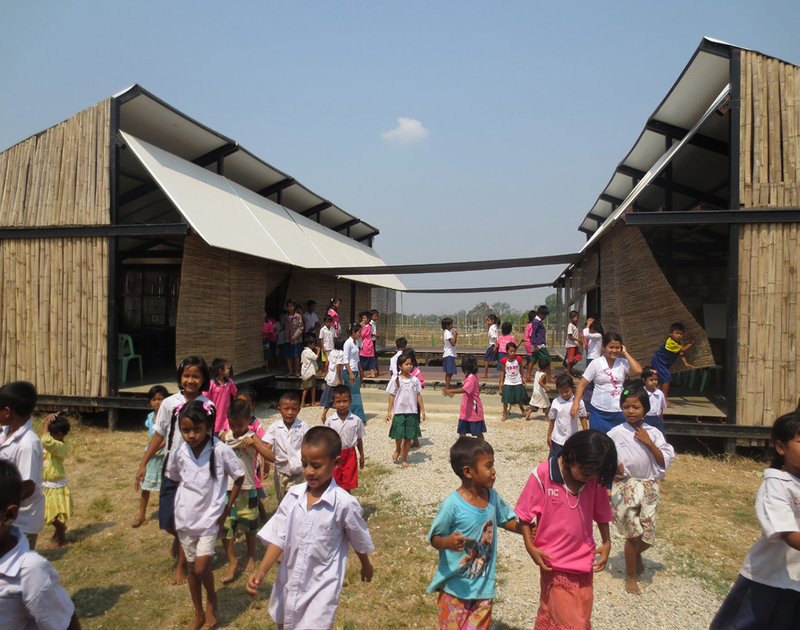 In the second MOVINGschools project, for example, the local community was highly involved in the design of the building from day one; from choosing the structures, location and size and discussing construction methods to participating in the construction itself, the community of “end users” also became the designers and deliverers, playing a meaningful part in positive local change. IT IS THIS KEEN AWARENESS OF THE BIGGER PICTURE THAT SETS BUILDING TRUST INTERNATIONAL APART. The project has provided a dedicated space for children that needed educational opportunities. In the UK, some find themselves homeless for a number of social and economic reasons. But for those in Cambodia, where Building Trust’s most recent project took place, it is the environment that can play a destabilizing role. 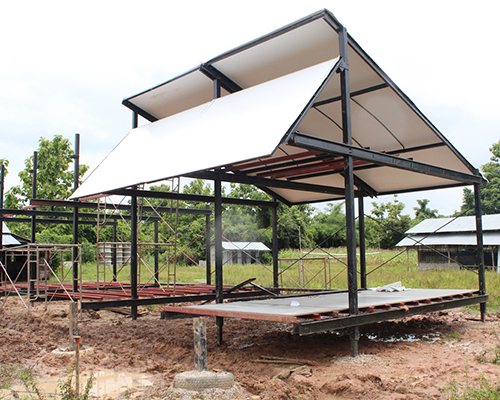 Last year the charity hosted a design challenge to find a sustainable housing design to meet the needs of Cambodia’s poor population affected by the constant threat of flooding. 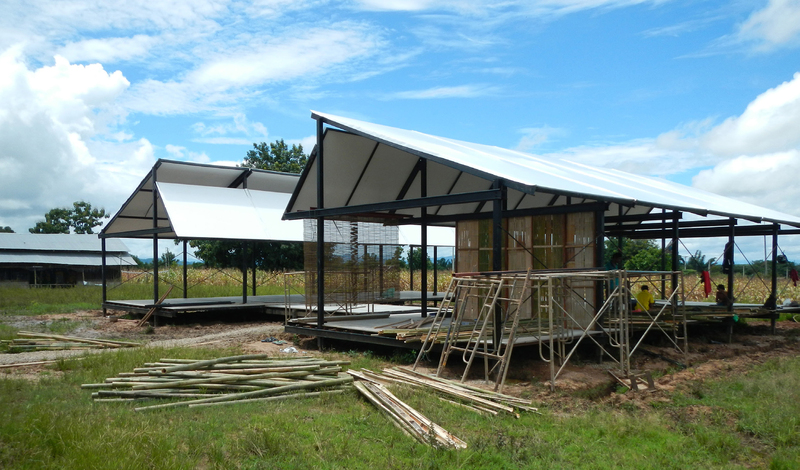 As a result they worked alongside Habitat for Humanity Cambodia (H4HC), with funding from the Elton John AIDS Foundation, and delivered three new housing designs that H4HC now offer. The winning designs from the competition were chosen by the families who now live in them, a participatory process often followed in Building Trust competitions. “It was fantastic to offer a range of designs to the families… providing them with a choice in their home design and a new start which they can define,” explain the Building Trust’s co-founders. True to the charity’s name, methods like this go a long way towards instilling and building trust in their design process. 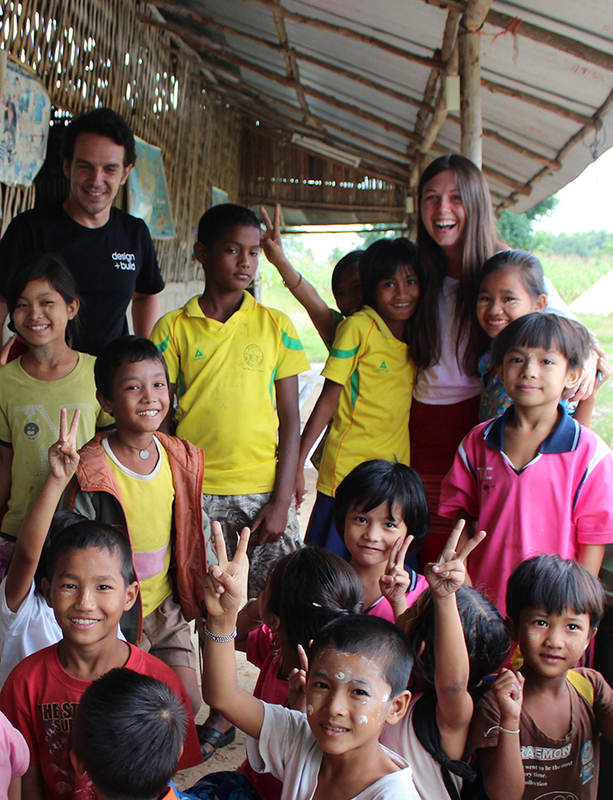 David and Louise Cole are pictured with local children at the site of their Movingschools project. 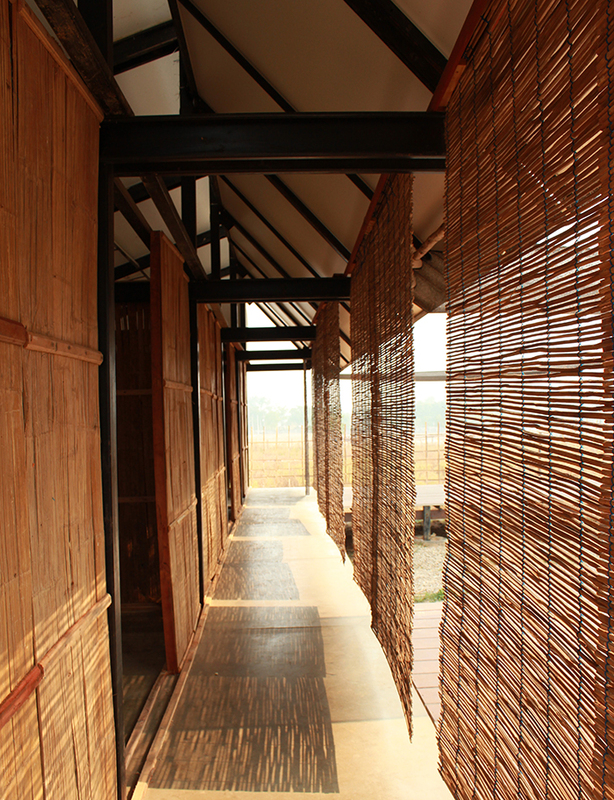 Image of the exterior corridor and sunshades of the first MOVINGschool project. The newest competition to be launched by Building Trust is “Moved to Care” which challenges design professionals and students to create proposals for a transportable medical health centre to be implemented in remote or mobile communities within Southeast Asia. Access to healthcare services in these rural communities is sorely limited, particularly in contrast to their urban counterparts; this means that those living in rural areas are sicker as well as poorer. Building Trust believes mobile medical services could address this discrepancy between health needs and service provision, lowering death rates and improving lives. Small mobile medical units could bring care to these otherwise disconnected communities,by creating space for qualified medical staff, immunizations, screening, medical advice and vital information. This need for relocatable designs, paired with the desire to connect remote rural groups with improved healthcare, led Building Trust to create the Moved to Care design brief. Building Trust is accepting submissions from professional and student architects, designers and engineers until the end of February, aiming to choose the winning proposal at the end of March. The co-founders hope that this first Moved to Care competition will generate ideas for healthcare solutions for refugee and displaced groups elsewhere in the region and globally. Building Trust’s individual projects form catalysts for a much wider design impact: “The real aim here,” the Coles explain, “is in proving value of design within resource-limited communities on a micro scale and providing solutions to a resource-limited planet on a macro scale.” Organizations such as Building Trust International offer hope that we are incrementally moving towards a better world, one where trust is built in design as a positive process as well as a solution. If socially minded, community-integrated practice becomes more deeply embedded as a collective starting point, then we can anticipate at least a deceleration, if not an overhaul, of current widespread profit-oriented design and development. The aspiration is that not only architectural and design practitioners, but also clients, will participate in and promote these beneficial processes. 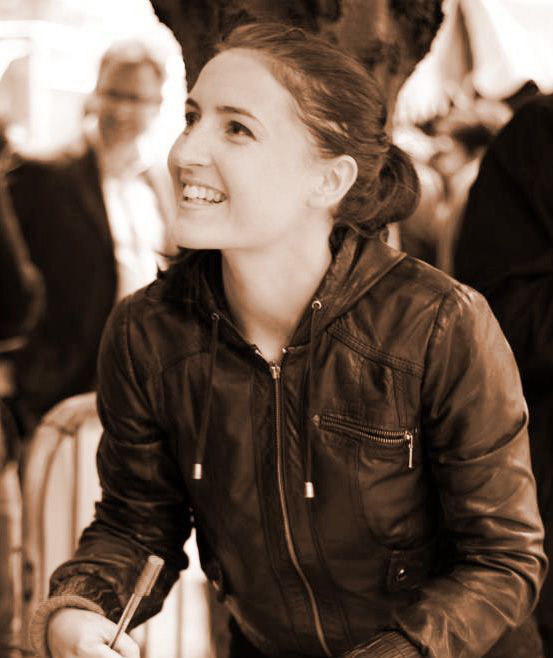 Building Trust International looks set to play a crucial role in moving towards this more positive future for design.